Desborough Town and Rothwell Corinthians showed no mercy on their lower-ranked opponents as the ChromaSport & Trophies United Counties League Premier Division dominated Division One in the first qualifying round of the Buildbase FA Vase. Ar Tarn, who have started the season in superb form, thrashed Woodford United 10-0 at the Waterworks Field with Jake Bettles being the hero with five of his team’s goals. Liam Boath scored twice while Jason Turner, Lewis Jackson and Mark Redding added the others. Desborough will take on another Division One club in the pre-drawn second qualifying round on September 24 when they entertain Whitworth, who had few problems in brushing aside fellow second-tier side Stewarts & Lloyds 4-0 at Occupation Road. Rothwell Corinthians also went goal crazy as they hammered Burton Park Wanderers 8-0 at Sergeants Lawn. Jory Mann led the way with a hat-trick while Jordan Henson (2), Kalon Peniasko and Lewis O’Dell were also amongst the goals. Corinthians will entertain another local Division One side in the second qualifying round with Irchester United being the visitors. The Romans had a fine away-day at this stage as a late winner from Ty Clark sealed their 1-0 success at FC Deportivo Galicia. Thrapston Town also moved into the next round as they claimed an impressive 2-0 victory at AFC Hillgate thanks to goals from Cory James and Dodzi Agbenu. But Raunds Town were unable to get the better of Premier Division outfit ON Chenecks. Jamie Russell brought the Shopmates level at 1-1 on 71 minutes but Chenecks struck three times in the last quarter-of-an-hour to secure a 4-1 win at Kiln Park. 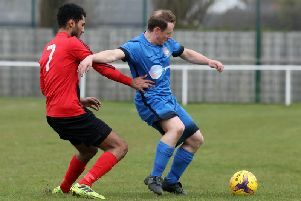 Rushden & Higham United also went out as they lost 6-4 at Winslow United. After taking the lead courtesy of an own-goal, the Lankies went 5-1 down before Dylan Wilson and Wayne Abbott brought it back to 5-3. They conceded another and Thomas Martin then grabbed a late consolation.